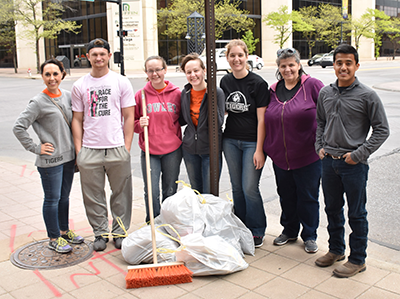 Representatives from Cowley College recently donated their time to help with the Wichita Downtown Development Corporation Clean-up Event. The group put in over 30 hours of service and counted 18 bags of trash collected in eight city blocks. Cowley College online student Luis Hernandez drove all the way from Enid, OK to participate and was joined by fellow students Abigail Farley, Elizabeth Farley, Lydia Farley, Nathan Bales, and Brock Webb. Cowley employees Sarah Bryant, Josh Cobble, Marcus Hicks and Loretta Waldroupe also helped with the event.